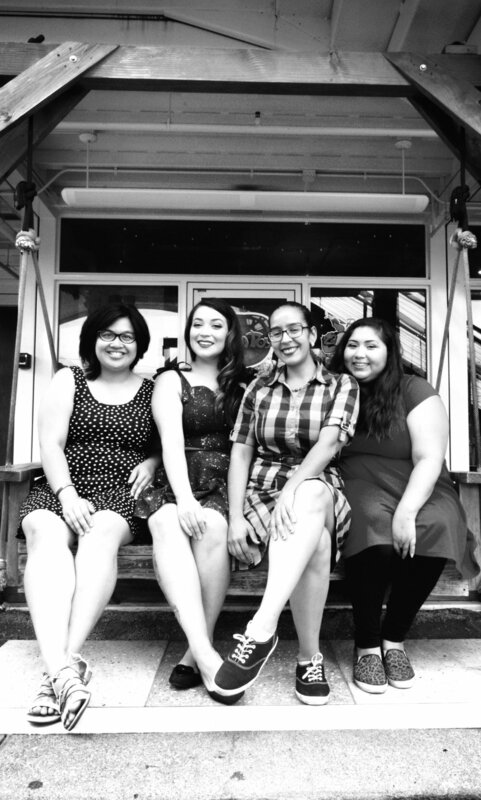 Girls Reaching Radical Levels of Success (GRRLS) is a new nonprofit group in Las Vegas created by Crystella Quintero, Jean Munson, Marisol Montoya, and Sandra Oceguera. The organization’s mission is focused on empowering young women in the community and inspiring them to try new things, create art, and empower each other through youth leadership conferences, workshops, and similar events. To date, every event the organization has put together has sold out, pointing to a true need in the community. You can keep up to date with their events and organization on Facebook at GRRLS (facebook.com/grrlslv). VIM: Hello! You are all part of GRRLSLV. Tell us how you got involved in the organization and what your goal for the nonprofit is. CRYSTELLA QUINTERO: I have always loved doing youth outreach. I was an ArtsBridge scholar during my junior year of college and that experience really gave me a passion for empowering youth through creativity. When the lovely Jean had the idea to have a female youth conference I knew I wanted to be involved. We organized an amazing leadership conference with Very Awesome Girls LV and that branched off into the nonprofit GRRLS. The goal of GRRLS is to empower and educate young women in our community. Through female representation and workshops GRRLS is helping to create future leaders and a stronger community. JEAN MARIE MUNSON: I had met the other board members of GRRLS at the nerdy girl group Very Awesome Girls Into Nerdy Activities (V.A.G.I.N.A) . I wanted to create a mentorship program similar to V.A.G.I.N.A. for younger girls that felt insecure about being nerdy, strong, and smart. So GRRLS (a term coined by now Founding President Crystella Quintero) was originally meant to be a conference that featured our strengths as older geeky women as well as raise funds for V.A.G.I.N.A. MARISOL MONTOYA: I became involved with GRRLS through the first conference. When the conference was being planned the question was floated around as to what workshops we would be able to offer. I have experience teaching boxing and Muay Thai. I feel like self-defense is something I’m passionate about and young people should learn. My goal for GRRLS is to offer young women tools to be successful especially in areas that may not typically be welcoming of women. I would like it to be something that if I myself, would find to be fun, useful, and interesting. SANDRA OCEGUERA: I got involved in the first GRRLS conference where Crystella and I ran a workshop on zine creation. We had so much fun teaching the girls how to create zines with mixed media, many of whom had never heard of zines before. I was inspired by the creativity and sense of humor the girls had in making their own. Going forward, my goal for the group is to continue creating workshops and events that truly empower girls and women to create and try new things, inspiring them to continue it outside our events. VIM: What future partnerships would the organization be open to? CRYSTELLA QUINTERO: We would love to partner with organizations that are also focused on empowering women and youth. An organization I would personally love to partner with would be Girls Who Code as well as local schools. JEAN MARIE MUNSON: I hope that we continue partnerships in the valley that represent women of color. GRRLS also supports all ages events that feature leadership development for diverse women and their interests. Our board is comprised of this very model of versatility. We have women that are interested in social justice, self-defense, environmental preservation, immigration rights, comics, art, graphic design, and public speaking. MARISOL MONTOYA: Anyone that wants young people to be successful! I think we are at a point as an organization where we have the flexibility to work with many different organizations. I personally would like to partner with a lot of the boxing gyms, athletic commission, and gyms that teach various martial arts in Las Vegas. I am very grateful to the coaches and trainers that I have been lucky enough to work with. They had the same expectations for me as they did of any guy they were training and ensured that their gyms were a safe space for me to be. I want other young women to know that these sports have a lot to offer them and that if they choose to participate there is space for them. I also would like to connect with different education organizations. Education is so important offers many tools for people to be successful, whether that be tutoring, supplies, money for college, or special camps for their interest. SANDRA OCEGUERA: I'm really excited to be a part of the Winchester Cultural Center's Dia de los Muertos event where we'll have an ofrenda. I'd love to see GRRLS partner with both local and national organizations with similar visions of empowering young women, promoting their work, art, and passions. Ideally, I’d like to see us work with groups who are focused on children who are coming from backgrounds that can hinder their success later on in life and help lift them out of it. Here in our community we have talented children who fall through the cracks and aren’t able to reach their full potentials. I’d like to partner up with any organization that is willing to help lift those children up and allow them to succeed. We can use all the help we can get given that our organization is new and still getting established. VIM: Tell us all a bit about yourselves. What brought you to Las Vegas? CRYSTELLA QUINTERO: I am a graphic designer currently finishing my undergrad degree at UNLV. JEAN MARIE MUNSON: I am Filipino-American that was born and raised in Guam for the first 18 years of my life. I came to UNLV, to pursue a history degree and eventually become a high school teacher. Life did not go as planned and I am now 30 years old and the owner of Plot Twist Publishing, a kick boxing instructor, and the leadership conference coordinator at UNLV’s Women’s Research Institute of Nevada. MARISOL MONTOYA: I am a literacy tutor for 2nd and 3rd graders. I have been doing Muay Thai for 16 years and was certified by the Thai government in 2014. I began boxing in 2014 and teaching women pugilism since. I really enjoy gardening and reading with my 3 year old son. I was born in Las Vegas. My parents meet here in 1986 as my dad was walking across the United States to protest nuclear proliferation. I went to University of Hawai’i and majored in Political Science. I loved it there but a strong message I heard while I was there was that you should make the world a better place, where you are from. So, I came back to where I am from and am trying to do just that. SANDRA OCEGUERA: I’m a first generation Mexican American who grew up in the Las Vegas suburbs. Like many classic immigrant stories, my parents made a big deal out of working hard to attain a higher quality of life for my siblings and I but being first generation comes with its own struggles in navigating worlds that are very different from our parents’ and I think that has shaped so much of my passion in wanting to help others. I work in social services, serve on this board and Very Awesome Girls LV’s, as well as write freelance, while raising my three children and finishing up a degree. VIM: You all had an event that featured a documentary about the untold history of women in the comic book industry. What woman have been an influence in your life? JEAN MARIE MUNSON: My Professor Joanne Goodwin at UNLV has taught many women’s herstory classes while I was fulfilling my undergraduate degree. Being her student, I was given a lot of context over the work that needed to be done for women. She eventually encouraged me to apply to the National Education for Women’s Leadership Program Summer Institute. They only choose 25 student leaders in the entire state of Nevada each year and I was able to attend in 2009. This is the moment in my life that opened many doors to other amazing womentors and friends that I still keep in touch with today. CRYSTELLA QUINTERO: My mom, grandmother, Selena and Dana Scully have probably been the most influential women in my life. I like to think I’m some amazing monstrous mix of them all. MARISOL MONTOYA: So many! My mom, my grandma, Maya Angelou, Dolores Huerta, Claressa Shields, Dawn Barry, Reem Bassous, Hilda Solis, and Farideh Farhi to start off. My mom is a retired immigration attorney and is now a mentor. My mom is one of 9 children, grew up in the projects, was the first in her family to graduate high school, and put herself through law school. My grandma had 9 children, only had a third grade education, and faced adversity with a tremendous amount of dignity. She worked so hard, first on a farm picking potatoes and then cleaning hotels. There is dignity in all work and we should never take advantage of people for the work that they do. SANDRA OCEGUERA: My daughter and the women running this organization would honestly have to be the most influential females in my life. My daughter because she's so kind and smart and still believes that we're both capable of anything. It reassures me that I'm doing okay as a parent and that the future for women is always getting bigger and brighter. The rest of the board because they're so creative and self motivated. We had an idea and instead of sitting on it, we immediately acted on it and have created this amazing organization. I'm really inspired by their passion and drive to empower young women for the sole purpose of empowering women. VIM: How do you envision GRRLS growing in the next couple of years? CRYSTELLA QUINTERO: We are really going to focus on become established in the community over the next couple of years and create events the community looks forward to. We hope to have a physical location for our workshops and larger conferences in the future. We have already had so many amazing people come out and support us so we can’t wait to see what the future has in store for us. Our next event will be an ofrenda at the Winchester life in death festival. JEAN MARIE MUNSON: I hope that we can continue to be a cost effective, educational, and accessible leadership resource in the Valley. I hope that every person that experiences this non-profit organization’s events can help us build a larger network of women leaders and allies. I envision that we keep having innovative programming that directly address issues and fosters interests for women all over Nevada. Right now, we have a strong following from local parents that are fans of what we do and how we do it. MARISOL MONTOYA: The women that make up GRRLS are incredibly talented and dedicated, I am honored to call them my friends. I see GRRLS growing into forum for young girls to connect with other girls that have similar interests, develop themselves, and one day take over GRRLS. I want this to be a forum to teach these young women what we know and empower them. SANDRA OCEGUERA: If our conferences and movie screenings - Rebel GRRLS Reels - indicate anything, it's that we're here to stay. We had so many women confirm that there is gap in the community that we're filling by holding these events. My goals for the organization revolve around turning our conferences into annual events, holding other workshops, and continuing our growth in the areas of educating and empowerment.